Empty excess waste into a toilet, if possible. Then tape the diaper shut and place in a sealable bag, or close the bag that comes with your diaper pail or genie — wrapping up the diaper will contain the smell and keep away flies. Throw the wrapped diaper in the trash. Consider switching to cloth diapers. They are more eco-friendly than disposables because you can wash and reuse them. They can also save you money and help your child potty train more quickly, and are free of the dyes and chemicals found in most disposable diapers. If you have unused diapers, or an open package that you don’t want, donate them to charities such as the National Diaper Bank Network. Find out more. 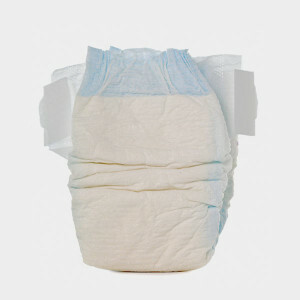 The average baby will go through 6,000 disposable diapers in its first few years. That’s over 2 tons of diaper waste per child, and 2.4 million tons annually in the U.S. alone. Read more from The Balance.